Expanding on the continued improvements, redevelopment, renovation and business and housing boom in Cincinnati, the Greater Cincinnati Redevelopment Authority has targeted investment strategies to repurpose neighborhood real estate and return property to productive use. Since 2012, GCRA has rehabbed and sold 19 formerly vacant homes in Evanston through Rehab Across Cincinnati and Hamilton County, and more are underway. In 2018, GCRA will begin work on affordable housing through its management of the Homesteading and Urban Redevelopment Corporation. What exactly is GCRA’s Target Neighborhood Strategy? According to GCRA, the plan focuses on engagement with neighborhood organizations as the proverbial eyes and ears on the ground; the identification of a small, defined priority area for residential and commercial redevelopment; and the use of a phased approach to revitalization. Since 2012, the 19 homes that have been rehabbed and sold in Evanston through REACH are located on Ruth, Blair and Woodburn avenues. Currently, two homes are on the market on St. Leger Place, and several other homes on Blair and St. Leger are under construction. Aside from REACH, several other partnerships/sponsorships have been integral to the overall success of the project. HURC received $300,000 in 2017 as part of NOFA-funded projects in Cincinnati neighborhoods; the rehab of six properties located on Wold, Jonathan and Woodburn avenues are expected to begin this spring. Other notable projects under the GCRA plan include a 6,000-square-foot commercial space on Montgomery Road, the Findlay Market farmstand on Hewitt Avenue in Evanston and two other commercial properties are on the market at Gilbert Avenue and Montgomery. 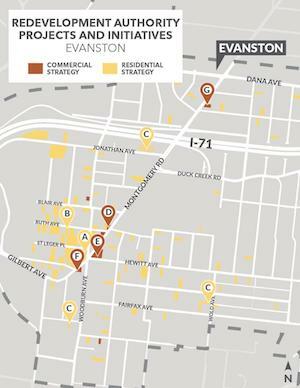 Several organizations have partnered with GCRA since the inception of the Target Neighborhood Strategy in Evanston. Lawn Life has been responsible for the cleaning up and maintenance of more than 30 homes in Evanston and employs 11 youth directly from the community. Building Value took the project on digitally and featured one of the deconstructed homes in their video series. GCRA has found huge success in the revival of the housing market in Evanston, with over 130 properties in their jurisdiction. The organization boasts an impressive investment in the neighborhood, including six lot-to-yard, five single-family home developments, one local government sale, 20 commercial/multi-unit properties, 19 REACH homes and one HURC home. Click here for more information on the revival of Evanston's housing market, GCRA, REACH and similar neighborhood projects in Greater Cincinnati.